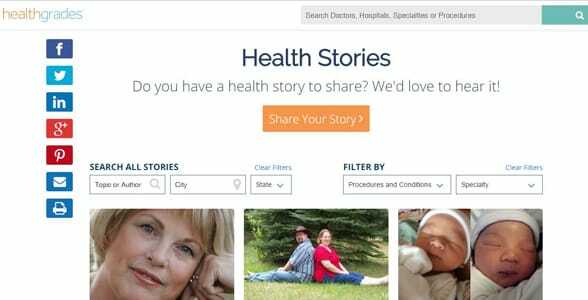 The Short Version: Healthgrades offers helpful online resources to connect patients and doctors across the US. The website’s simple search functions allow visitors to browse through more than 1.1 million physicians organized by speciality and location. 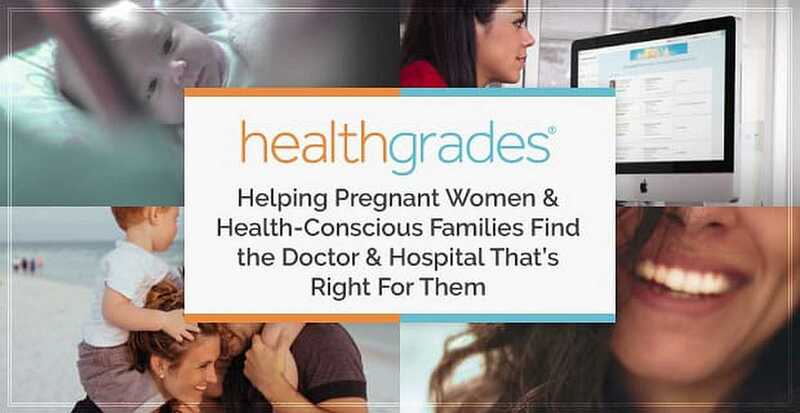 Whether you’re looking for a competent obstetrician, gynecologist, or family doctor, Healthgrades gives patients valuable information, including over 6 million consumer ratings, to encourage sound decision-making. Healthgrades also partners with hospitals to facilitate more meaningful and engaging interactions between health care providers and patients. The website empowers over 1 million daily users to learn about their health options and choose what’s best for their needs. The next time you’re due for a checkup, you can rely on Healthgrades to supply comprehensive information on local doctors of all specialties. When you’re pregnant, you face a lot of choices, from what kind of birth experience you want to how to decorate the newborn baby’s room. One of the first and most important decisions during a pregnancy involves choosing a health care professional to look after you and your baby. For first-timers, the process of selecting an experienced and reliable obstetrician can be a daunting task. Tiffany B., a pregnant woman from Port St Lucie, Florida, wasn’t satisfied with randomly picking a doctor’s name at random, so she went to Healthgrades to look up information about local OBs. After some online research, she and her husband discovered a highly recommended obstetrician named Dr. Dudley Brown. Encouraged by the physician’s positive reviews on Healthgrades, Tiffany contacted Dr. Brown and became his patient. Months later, she wrote her own Healthgrades review on the doctor to say she had had a phenomenal experience with him. According to the Tiffany’s review, Dr. Brown and his team were always professional and ready to answer any questions she had along the way. On Healthgrades, first-hand reviews (like Tiffany’s) give you a feel for the doctor and staff so you can choose your health care provider with confidence. Founded in 1998, Healthgrades is a comprehensive online resource for anyone seeking a local physician or hospital they can trust. The website has compiled information and reviews on 1.1 million physicians in all specialties and subspecialties, including family medicine, obstetrics, pediatrics, urology, and internal medicine. Visitors can go online to compare prices, read reviews, and select a doctor who’s right for their needs. On Healthgrades, visitors can look up information on over 1.1 million physicians, 2 million health care professionals, and 5,000 hospitals. From the company’s headquarters in Denver, Colorado, a dedicated team is on a mission to empower patients to choose a doctor with confidence. Whether you’re looking for a good dermatologist, gynecologist, or cardiologist, Healthgrades can help you sort through millions of local doctors, choose the right fit, and book an appointment from any desktop or mobile device. Healthgrades facilitates a conversation among patients submitting and reading reviews about their local health care providers. The open forum helps visitors compare experiences and select a reputable doctor in any specialty. On Healthgrades, you can read through over 1 million patient reviews and 6 million published ratings to decide if a particular health care provider meets your standards. The profiles clearly display the physician’s experience, areas of expertise, contact information, clinical quality ratings, and patient satisfaction scores. According to Healthgrades’ internal research, when the consumer possesses this type of information about a physician or practice, they’re 82% more likely to make an appointment. Healthgrades outlines a health care provider’s experience, quality, and ratings for consumers. Healthgrades fosters a community of patients sharing their stories with one another in reviews, testimonials, and blog posts. Women who are pregnant for the first time can go to the Health Stories section to read through what new mothers have to say about their experiences with pregnancy and labor. Healthgrades is more than a place to look up doctors — it’s a rich educational resource on the challenges faced by health care consumers. The site provides valuable information on a variety of health topics to help visitors make informed decisions when it comes to their health. Though its sister sites, Right Diagnosis and OurHealth, people can research various health conditions, diseases, symptoms, diagnoses, and procedures online. Whether you’re worried about an STD or curious about women’s health issues, these sites provide detailed and knowledgeable guidance for patients. To best serve the men and women who come to Healthgrades for answers, the website has expanded its educational content to cover all aspects of health care. In the Healthguides section, patients can learn more about sensitive health topics, including living with erectile dysfunction and coping with HIV. Information is presented in a clear, easily browsed format with recommended related reading available to help answer any followup questions. Healthgrades has several offices in cities across the United States, including Atlanta, Madison, Raleigh, and Denver. Functioning as a unit, team members work closely with one another on projects that significantly impact how patients interact with doctors and hospitals. 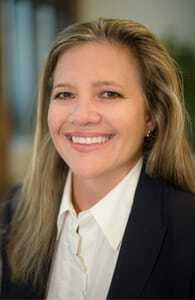 CMO Andrea Pearson joined Healthgrades’ marketing team in December 2008. Their combined efforts drive them toward their overarching goal of bringing more transparency to health care. With accessible information and user-friendly search tools, Healthgrades makes selecting or referring a health care provider easy. No matter what health issue you’re facing, it’s important to pick the right doctor who can help you. Thanks to Healthgrades, you don’t have to rely on guesswork to find a physician you like — you can search online through detailed profiles on over 1.1 million physicians and 2 million health care professionals. Healthgrades provides a combination of objective biographical information and subjective patient reviews to give consumers a full understanding of their health care options. The site makes it easy to find many trustworthy doctors and hospitals across the country. Pregnant women, like Tiffany B., can use this resource to choose a local OB who’s the best fit for them. Over 84% of Healthgrades.com’s consumer reviews are positive with a 4- or 5-star rating. 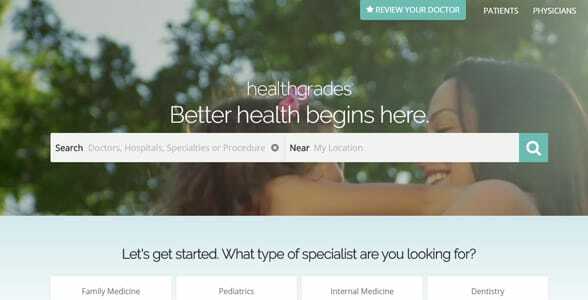 Healthgrades.com’s technological solutions are rapidly changing the way people interact with doctors and hospitals. The site enables consumers to quickly search, select, and book an appointment with a physician they can trust. In a few clicks, you can make sure you and your family are well taken care of.